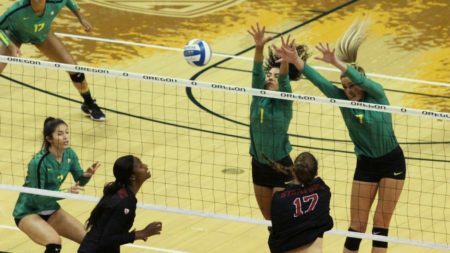 The second ranked Stanford Cardinal swept the Oregon Ducks is straight sets 25-19, 25-21, 25-23 Friday evening at Matthew Knight Arena. Earlier in the day head coach Matt Ulmer learned he would be without the services of outside hitter Jolie Rasmussen, forcing a lineup change on the fly. For the first time since her high school days senior Taylor Agost played a full rotation with Ronika Stone moving to an outside hitter slot and Lauren Page filling in at middle blocker. It was lineup that hadn’t practiced together and in the early going it showed. The Ducks took a 12-9 lead in the first set but then saw the Cardinal reel off 15 of the last 22 points to claim the first set. “It was ugly in the first, so I thought we came a long way as the match progressed,” said Ulmer. The Ducks did make more of a contest of it in the last two sets but was unable to hold off Stanford in down the stretch.The Cardinal out-pointed the Ducks 8-3 to close out the second set and then scored five of the last seven points to win the third and complete the sweep. The Cardinal out-hit the Ducks .337 to .198. Agost led the way for Oregon with 11 kills. With the win the defending national champion Cardinal remains unbeaten in conference at 5-0 and 12-2 overall. Oregon falls to 9-4 on the year and to 2-3 in Pac-12 play. The Ducks next host California on Sunday beginning at 2:00 pm.